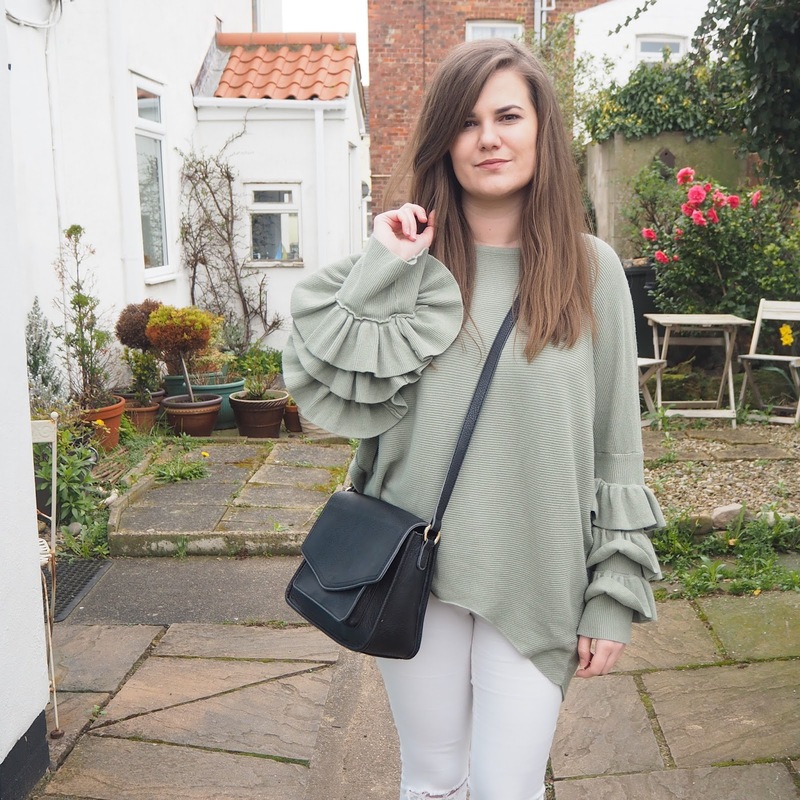 That's Peachy | Award Winning North East UK Fashion, Lifestyle, Beauty Blog: Does Being A Blogger Make Me A Failure? Does Being A Blogger Make Me A Failure? I like to think of myself as quite a positive person, I'm definitely a glass half full kinda gal but sometimes, things can get you down, even if you don't know what it is that's making you feel that way and I often find myself questioning what the hell I'm doing. I ask myself, am I a failure? Do other people look at me and snigger... What is she doing with her life? I know there are people out there in my real life and online, who must look at me and other full time bloggers, assuming all we do is play with makeup and type away to our hearts content all day every day - If only it were that simple. Some people just don't get it. I had a meeting a few weeks ago that's still playing on my mind and annoying me. 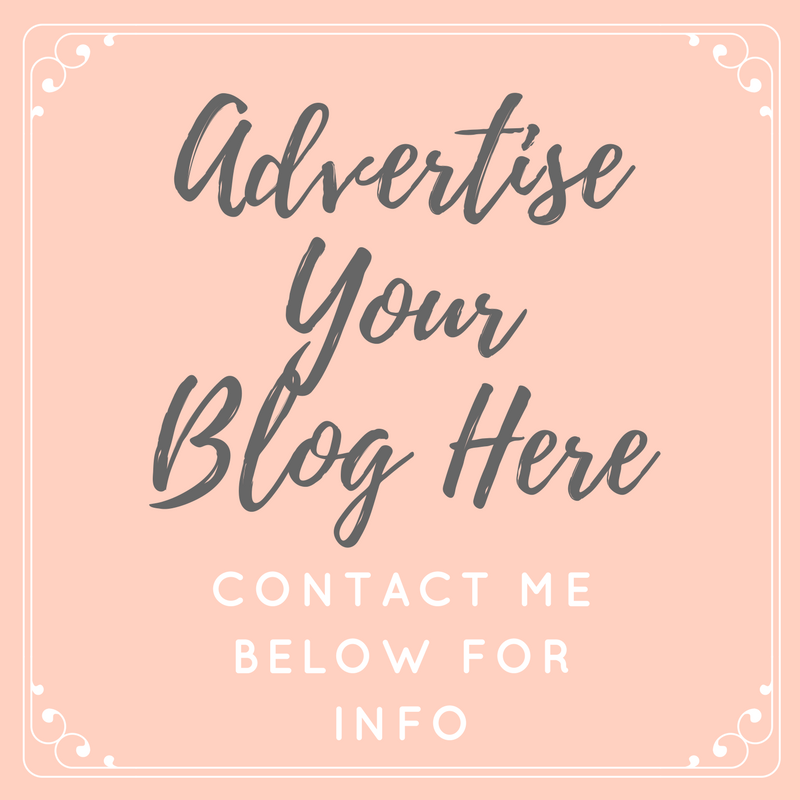 I was questioned over what blogging was, was it worth while, was it actually a career, and despite having strong positive views to all of the questions, I left feeling disheartened. I spend hours and hours every week taking and editing photographs, be it of beauty products, of myself, of my outfits, that's only the beginning. Being a blogger is kind of an all in one roll, you don't have a PA to answer the annoying emails that will in the end turn out to be a waste of time, or to proof read your work, or even to give you that kick up the you know what when you're feeling a little deflated - I'm a one man band, and I'm proud of the blog I have created. I guess I'm kind of going off topic here, or answering my own question... So no I'm not a failure, but maybe you can see why I think I am sometimes. I didn't go to university, which was a decision that surprised me a little if I'm completely honest. I'm very business minded, and always assumed I'd work my way up in some big career of some kind, but that never happened. Over the years I have questioned myself over that a lot of times and now and again I wish I'd just gone with my gut feeling and taken my studies further. I always wanted to be an interior designer... Which is still a career I look at and think, yeah, I'd love that. I think the line of education all went wrong at college for me. I liked school and achieved really high grades, but when college came along I just didn't like it and the thought of committing to years more of education just didn't make me happy. I worked hard at college, and passed my A levels, but that feeling of completing college and being able to go and get a job and earn money was the best feeling I'd ever experienced. I never had the aspiration to become a full time blogger like people do these days. For me it just happened naturally, and I think that's the best way, after all, everything happens for a reason. Another thing that puts doubt into my mind is wondering if I really have any talents I can shout about? Hmmm... probably not if I'm honest, but I am changing this and have something that excites me greatly coming up in the Summer that will hopefully allow me to launch a new business of my very own. I don't want to say too much on this now as I don't want to jinx things, but if all goes to plan, I'm going to be very happy. Basically, life is good right now, and if people want to think I'm a failure, I'm going to let them. I have no regrets. In other news, how good is the weather lately?! 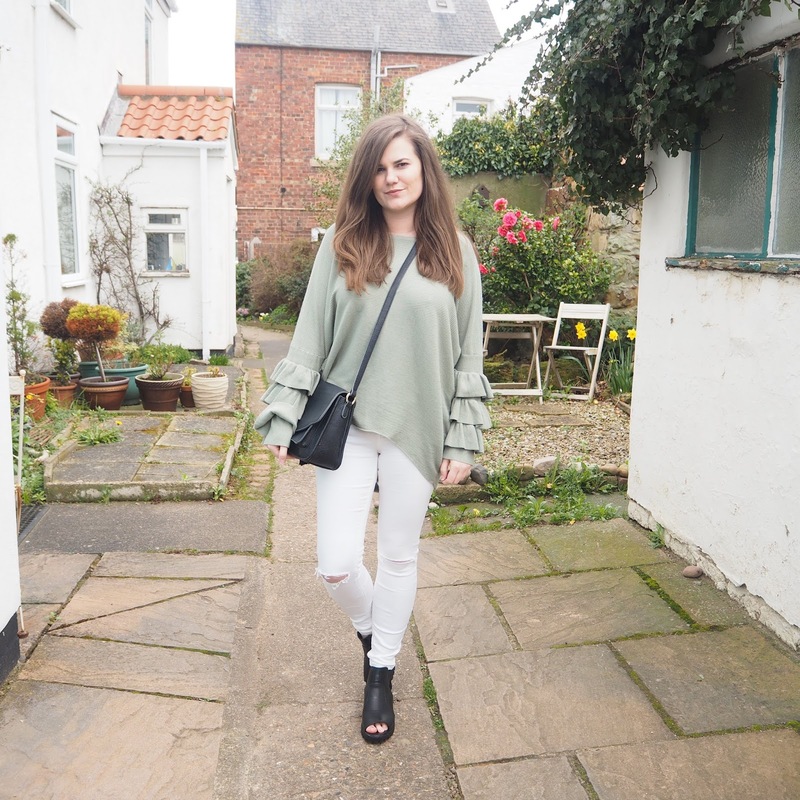 We've even had a bit of sun up here in the North East which inspired to pull out this very Spring inspired outfit, I even got my toes out! 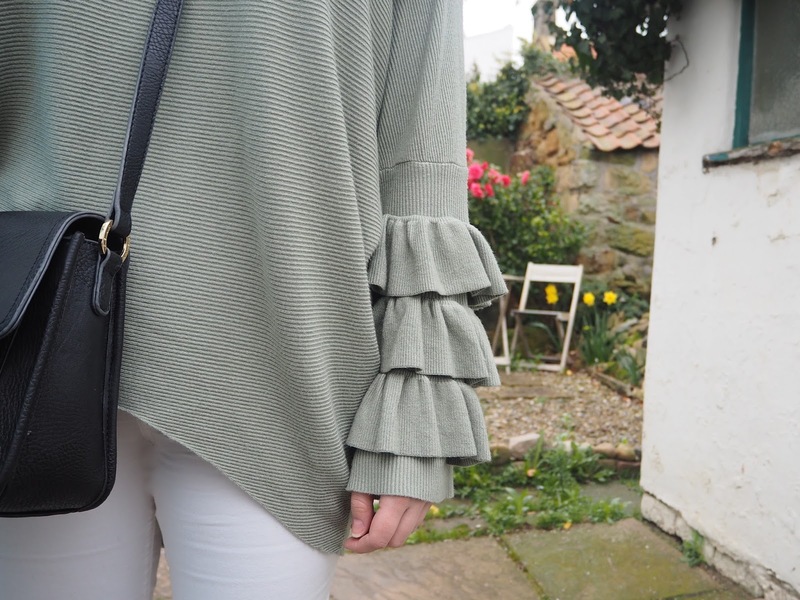 I received this jumper about a month ago from the lovely people at Bows Boutiques, and it's been one of those pieces that I just can't get enough of. It's really heavy weight, so hangs perfectly and the sleeves... Oh the sleeves, I just love them so much! They make a huge statement without being OTT and they're a real conversation starter. 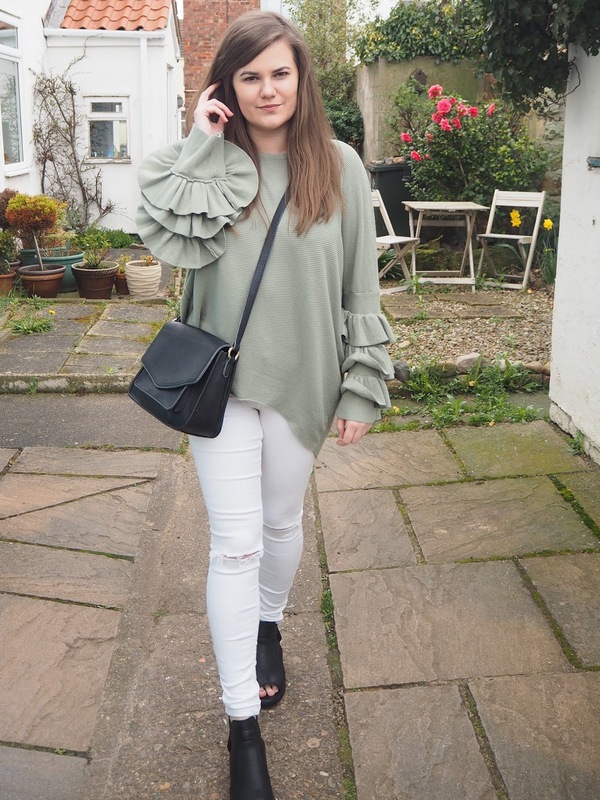 To make it reflect the warmer weather, I teamed it with my trusty white jeans (that I had to pull out from the back of the drawer) and accessorised with chunky black accessories for a bit of contrast. Are you looking forward to ditching the coats and dressing a bit more weather appropriate soon? What are your go-to pieces for Spring? You and a failure, or any bloggers and being a failure is not a thing. At all. Full stop. As you say, you are a one man band and a self taught one and once you start listing all you do to run a blog, that's some some list and some skills!